Evans on his way out – what kind of legacy will the Whelan family leave behind? Lee Evans’ departure will be a blow for Paul Cook. 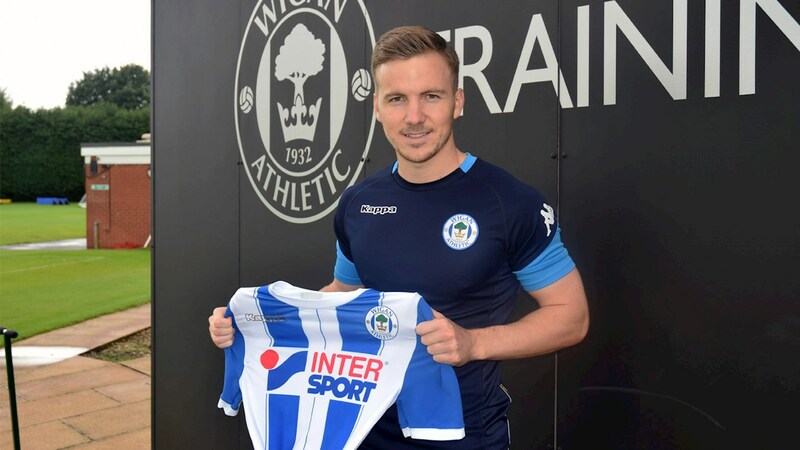 Photo courtesy of Wigan Athletic. Things had been going so well for Wigan Athletic. Promotion back to the Championship had been looking a near certainty, following the club’s best-ever start to a league season. But will the impending departure of Lee Evans prove to be an indicator that the promotion will not be as inevitable as it might have seemed? Evans will certainly be missed. He and Sam Morsy have been the most successful central midfield pairing since the halcyon days of the “Jimmy Macs”, McArthur and McCarthy. That Latics have conceded only 12 goals in 25 league matches is not only due to having a solid defence. lt should rightly be attributed as a whole team effort, but the protection provided by Evans and Morsy in front of the back four has been exceptional. However, Evans is much more than a midfield enforcer, his range of passing adding an extra dimension to Latics’ play, particularly in his delivery from set pieces. It is no coincidence that he leads the team in assists. According to media reports, Wolves will sell Evans to Sheffield United for a fee of around £750,000. The player will join a club with aspirations of promotion to the Premier League. A couple of seasons ago Wigan paid more than that to sign Will Grigg, to help them get out of League 1. They also paid around £600,000 to secure the services of Yanic Wildschut, whose permanent signing proved to catalyse that League 1 title win. By paying out that kind of money Latics had shown ambition, albeit buoyed by the parachute payments the club was receiving at the time. Sadly the ambition showed in 2015-16 was not to be replicated the following season, when pre-season spending of around £3 m was modest compared with the norms of the Championship. Gary Caldwell had reportedly wanted Hearts right back Callum Paterson and Barnsley midfielder Conor Hourihane, but it did not happen. The right back position was to prove problematic and the quality of delivery that Hourihane can provide could have made a big difference to Caldwell. In the January 2017 transfer window, Sharpe found Norwich’s generous offer for Wildschut too good to refuse. The end-result was the club getting relegated, but nevertheless making a profit. Reports suggest that the K8 consortium is poised to take over Wigan Athletic, but is awaiting EFL approval. The Whelan dynasty at Wigan therefore appears to be reaching its end. The club had overachieved for so long, winning the FA Cup, reaching the League Cup final, with eight years in the Premier League, including luscious wins over the elite clubs that dominate the English game. Dave Whelan’s drive, vision and financial backing underpinned those successes. However, in recent years some bad decisions have been made and, despite having received well in excess of £100m in parachute payments, the club finds itself in the third tier. The appointments of Owen Coyle, Malky Mackay and Warren Joyce were disasters waiting to happen and their lack of success was no surprise to the more discerning of fans. The appointment of Paul Cook in summer had appeared to set Latics back on the right track. But now with the club in limbo, waiting for the change of ownership to be confirmed, what can we expect to happen over the January transfer window? Will other key players in Cook’s squad be departing over the next three weeks? We can only surmise on what would have happened in the transfer window if the takeover had already taken place. Would the K8 consortium have given Cook the financial backing to keep Evans and to hold on to the club’s most prized assets? Would Cook have been given a treasure chest to buy players for an anticipated return to the Championship next season? Given the reality of the situation, with an ownership change still in process, what can we expect from Sharpe and his grandfather over the window period? We do not know whether Sharpe made a bid to Wolves to sign Evans on a permanent contract. But even if he had, would he have been willing to get into a bidding war with Sheffield United? The probability is that with Max Power and Shaun MacDonald ready to step into Evans’ shoes, the club was unwilling to seriously compete for the player’s services. Latics no longer have parachute payments and are unlikely to shell out big money over the window. Given that Sharpe appears likely to continue to hold the reins for some weeks at least, are we likely to see more player exits? Cook and the recruitment team spent no money on transfer fees over summer. Players were picked up as free agents or on loan. However, the media reports that the £300,000 transfer of Jamie Walker from Hearts is currently going through, despite the fact that the player has a knee injury and will not be available for some time. The 24 -year-old Walker may well prove to be a good signing in the long run, but what does it tell us about Sharpe’s intentions? Will Sharpe expect funds to be coming in to compensate? The media has been telling us that Steve Bruce wants to take Nick Powell to Aston Villa, although the player was under Bruce’s charge at Hull in the second half of the 2015-16 , but could not command a place in the starting lineup.Now the Sun complicates the situation by telling us that Powell will stay at Wigan if the Asian consortium takes over. Cook is in an unenviable position as this transfer window unravels. He is depending on Sharpe, who is in a sitting duck position, waiting for the takeover to happen. Will Sharpe, or ultimately his grandfather, allow clubs to come in and pick off key players, with the club in limbo? In addition to Evans and possibly, Powell, is there a danger of such as Dan Burn and Sam Morsy leaving too? Has there been any discussion between Whelan/Sharpe and K8 about how the transfer window will be handled? Whelan generally has the backing of the Wigan Athletic support, although there are critics who tell us that he is at heart a businessman. Would he sanction the selling-off of players prior to the takeover, damaging Cook’s attempts to get Latics back into the Championship? All will be revealed in the coming weeks.